NOTE: Outside the U.S please do not use the 'Buy Now' button below, rather contact us to order. Anyone with an interest in the Spanish treasure cobs being brought up from the ocean floor needs to have this as reference material. In very understandable language, learn about the minting procedures, the various denominations and designs, the markings and what they represent as well as a listing of all the mint marks and the known assayers, by names and dates. Illustrations of cobs, maps, coats of arms, and mint marks allow even the novice to gain a better understanding of the Coins of the Lost Galleons. Captain Kathryn (KT) Budde-Jones joined Mel Fisher's Golden Crew in 1981. She has participated in the archaeological recover of the treasure from the Nuestra Señora de Atocha, the Santa Margarita and the 1715 Plate Fleet. 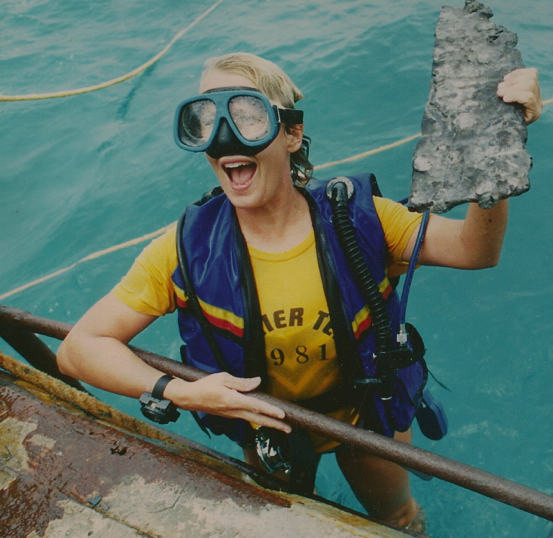 KT has participated in all aspects of the operation including captain, ship's engineer, archeaeological mapping, artifact recovery, conservation and research. KT shared the knowledge she accumulated in her thousands of hours diving through her development and participation in the Mel Fisher Maritime Heritage Society's education programs. KT and her husband Syd Jones, former captain of Mel Fisher's salvage vessel J.B. Magruder and Operations Manager, have expanded their interest in history. They presently work restoring and flying World War II bombers and fighters. An Educated customer creates an enthusiastic BUYER. Wholesale Coin Books available. For more information.